As part of SAP’s four-year $375,000 partnership with Sharks Sports & Entertainment, SAP Silicon Valley (SAPsv) works alongside the Sharks Foundation to create impactful programs and projects that positively impact the lives of community members across the Bay Area. 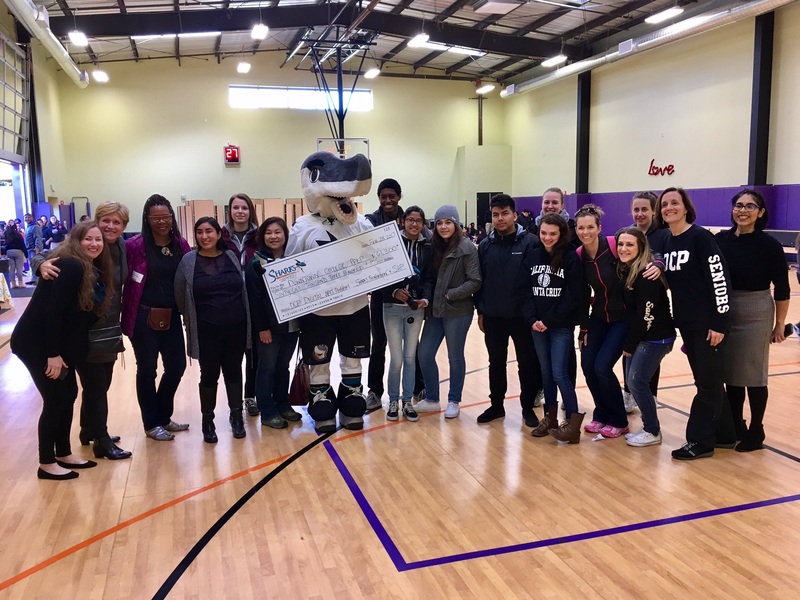 On February 28, SAPsv teamed up with the Sharks Foundation to expand Downtown College Prep’s (DCP) Digital Arts Program at El Primero High School in San Jose by donating $61,300 toward new equipment and learning tools. Fifteen SAP employee and Sharks Foundation volunteers spent the day meeting with DCP’s Co-Founder and Executive Director, Jennifer Andaluz, and interacting with DCP students and faculty. Volunteers loaded in brand-new Apple iMac computers, wireless keyboards, Nikon cameras, tablets and pens, and a laser printer to El Primero. Representatives from the Sharks Foundation and SAP also joined students to learn more about the Digital Arts Program (DAP) and took pictures, designed backdrops, and participated in other DAP activities. Jennifer spoke passionately about the impact SAP’s investment would have on her students’ future and said, “We are grateful to the Sharks and SAP for the investment in our students’ creative and college futures and for bringing them closer to the opportunity and innovation that defines our region.” She expressed how important it is for companies like SAP to help break the cycle of poverty and encourage students to see their education through to college. There was a time when only 1 in 100 low-income students in San Jose graduated from college. That time is no longer. More than 600 DCP alumni have made the dream of college a reality. They have made college success a newfound tradition in San Jose. It is a tradition born in the hearts of working mothers and fathers, a tradition nested in the dreams of immigrants. DCP seeks to provide a well-rounded educational experience and ultimately the skills that students need to succeed by offering a innovative, new arts education program. Through the new Digital Arts Program at its flagship high school, DCP El Primero High School. Providing students with an art program will help boost their performance in-school as well as develop the skills necessary to be successful through college and beyond. For more information on Downtown College Prep, please visit: www.dcp.org. Established in 1994, the Sharks Foundation is dedicated to enhancing the lives of youth and families in the community with an emphasis in the areas of education, health and safety, and character development. Since inception, the Sharks Foundation has donated more than $10.1 million to non-profit organizations, including more than $1.5 million during the 2015-16 season. To learn more about how the Sharks Foundation is helping underserved youth and families in need in the community, visit the Sharks Foundation’s website or 2015-16 Community Report, or connect via Facebook, Instagram or Twitter.